After a lot of doubt and grumbling, Grumpy Gus jumped in with both feet and more! Our first step, after removing the carpeting, was the cushion makeover. Since I have never sewed much of anything, I chose the wrap and staple method using drop cloths, which I liked because they were neutral, pretty stain resistant, and not as costly as some fabrics can be. These have worked out fairly well, considering I have a two year old grandson. It was definitely a challenge when we came to the L-shaped corners. Those were tricky! Thank goodness I had some throws and lots of pillows to cover the flaws. The next step was tackling the cabinets. We removed the doors and drawers and left the cabinets in place. We primed the cabinets and walls with Kilz interior oil base and used one can of Sherwin Williams Moderate White latex paint. We painted on one coat of primer and two coats of paint and let them thoroughly dry before putting the drawers and doors back on. The most challenging thing for us was installing the flooring. 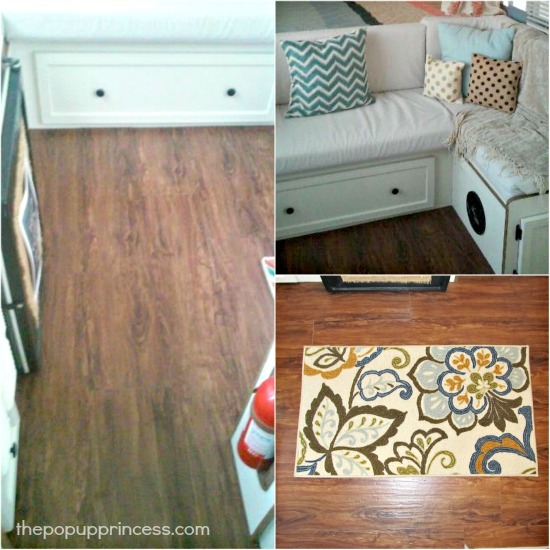 We used four boxes of Vintage Oak Cinnamon plank vinyl flooring from Home Depot. At $58.00 a box, that was a little more than we expected to spend. As previous readers had mentioned the camper is not squared up, so let’s just say there was a lot of grumbling going on for a few days. We installed around the cabinets–it was NOT an easy task–but looked good when finished! I wanted curtains across the bunkends, so I used tension rods from Bed Bath & Beyond, costing $26.00 for the two, to hang them. The curtains themselves came from World Market on a closeout sale. Yeah!!!! 😀 They have stayed in place nicely, even with my active two year old grandson. Once again, we were apprehensive about sewing, but we got lucky and found a very nice lady that shortened them for free. Much to my dismay, I measured them incorrectly so we ended up having to shorten them a bit, which is when I found out Grumpy Gus COULD actually use a sewing machine! Hmmmm…. All in all, we finished the makeover in about eight weeks and decided to keep the original countertops since they were in good condition. That helped with the budget, and yes, Grumpy Gus was very happy with the end result. All the bedspreads and accessories were luckily found on clearance at local department stores, the Target dollar bins, and I also used several things I had from around my house. Thanks for sharing, Glenda! I’m so impressed with the end result. 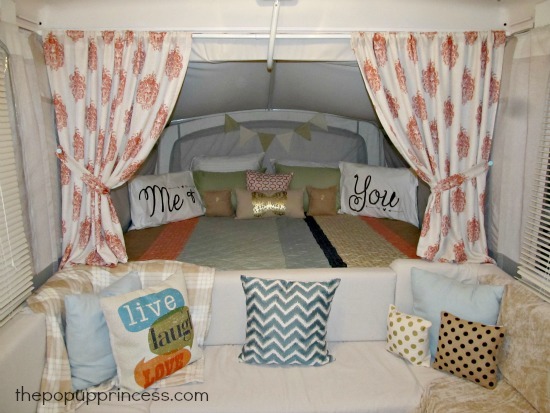 It’s definitely one of those campers you could spend a rainy afternoon in, and I’m sure you and your grandson will be making lots of memories you’ll both cherish for years to come. Bravo! 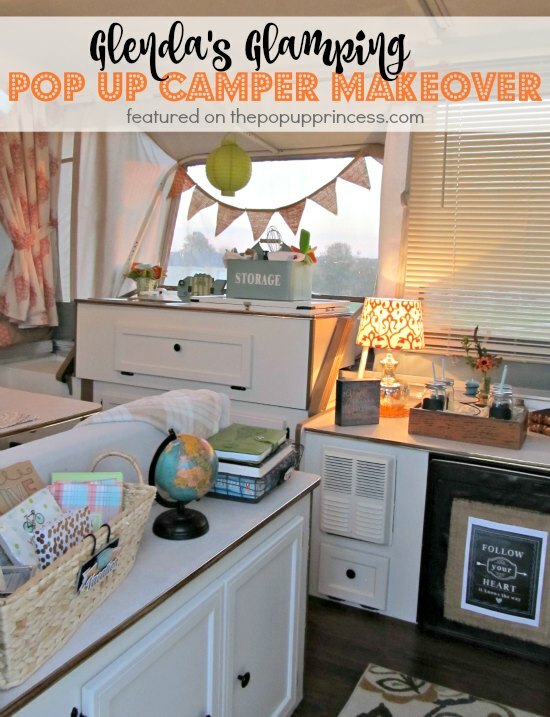 This is the same Camper style (though different year) we have! This gives me a great ideas for redoing out 1998 Coleman Sun Valley! Looks awesome! How do you attach the mini blinds? Do you have to remove them when you close it up? Thanks so much for your comments, the other makeovers were so amazing, I was so inspired by all of them!!! 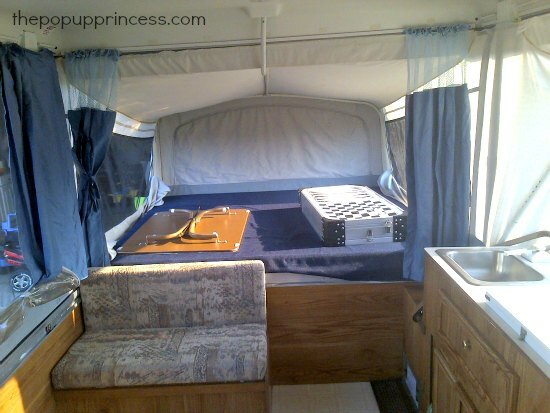 The mini blinds were attached by small screws to the upper part of the camper window where the slide track of the old curtains were. Mine have metal spring clips so I just pop them out of the clips and store them inside the camper. I haven’t tried leaving them up when we put the camper down. I forgot to mention earlier that I also just release the tension rods on the bunk end curtains and lay them across the bed when we put the camper down. What a great makeover! I love how cozy it looks! 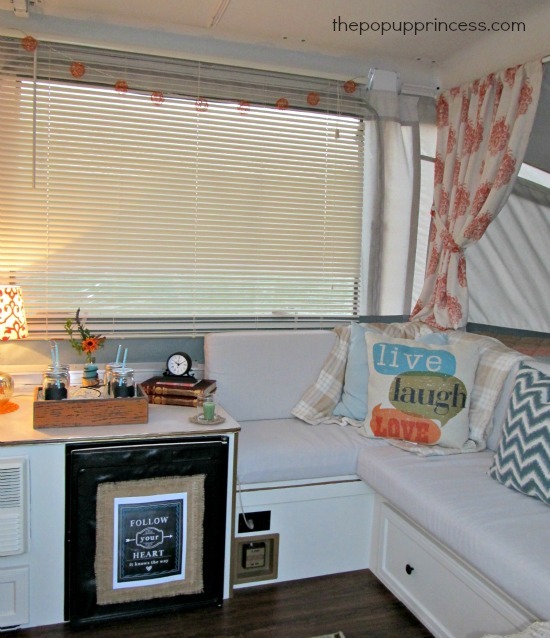 Can’t wait for spring when we can take our’s out of hibernation and start camping again! Glenda, it’s absolutely fabulous! I’m smitten! Great job, I know it was a challenge, but you’re going to get so much pleasure out of your little pop-up! Thank you! I plan on creating a lot of memories with one extra special grandson! This is beautiful Glenda, perfect inspiration for my 96 sun valley. It’s cozy and kinda beachy, which is what I am looking for. 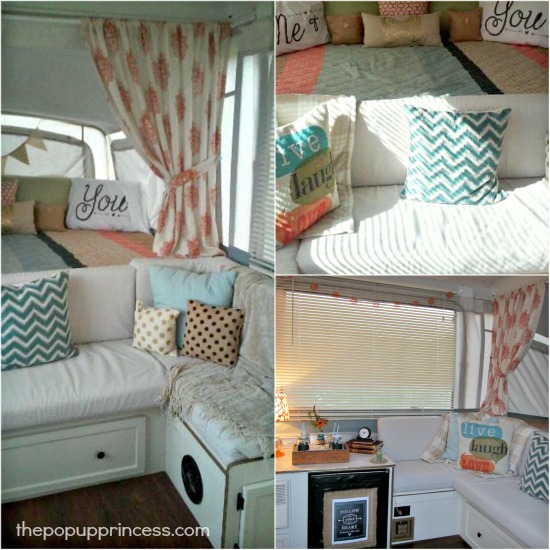 I am new to pop up camping, and more of a beach in the Caribbean kind of girl, but if I can make my camper look as good as yours maybe I wont miss the Mexican beaches as much. thanks for sharing! I love the look of the small table lamp. (Orange and white printed shade and glass base). Where did you find that and is it battery operated or plug in?? I would love to find a pretty battery operated lamp. Hi Ari, glad you liked the lamp! It is a plug in, the lamp came from Target and the shade I got at World Market. I did get some really cute battery lanterns for Christmas though from Target, they come in some pretty cool colors, might check their website. Love your pup re-do! I have the same model pup and am starting a make-over of my own. I have a question about painting the cabinets…I have the same cabinets with the inlaid “brass/gold” fake trim. Did you have to do anything special with it (like sanding?) or did you just prime it and paint over it? Also, did you swap out the hardware for new or did you paint it? Hi Karla, actually I just popped the gold trim off, it came off very easily and then I sanded, primed and painted the cabinets and bought new knobs. I tried painting the old knobs, but they started to chip, not sure if I didn’t sand them enough but I loved the dark newer ones so much I just went ahead and bought those. Good luck, sure you will enjoy the new look. Thanks for getting back t me! I was on the fence about painting the cabinets because I couldn’t think how to get ANY paint to permanently stick to that fake trim. Now it’s full speed ahead! I already have the new knobs and hardware picked out. Appreciate the tip! Thank you Nancy! I got the bedspread at Kohl’s, it is a Sonoma brand and it is reversible. I checked their website and they have some similar colors. Good luck on your makeover, we all will be anxiously waiting to see your results! 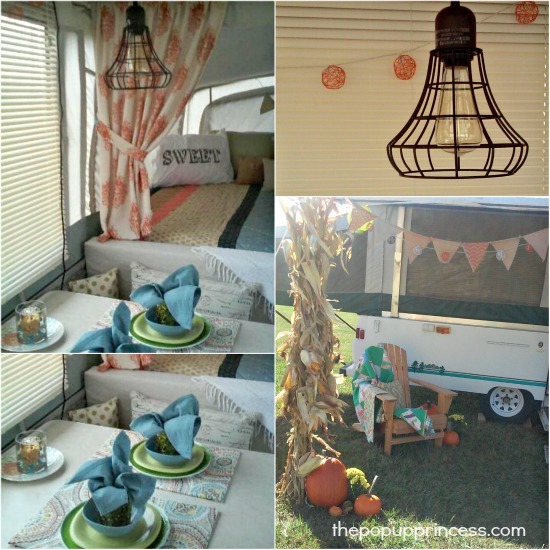 I was wondering how you hung the light fixture over the table, if it’s a battery operated and if you take it down when you lower the camper??? 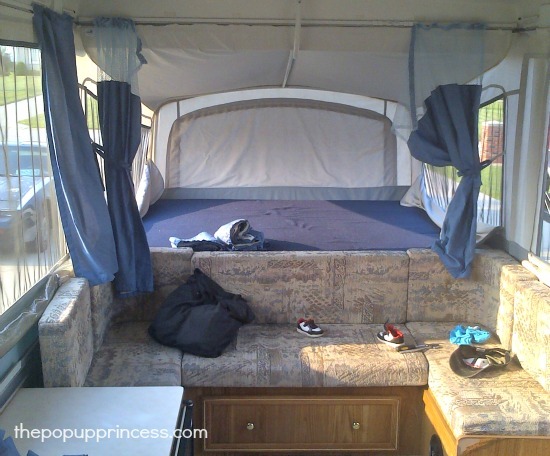 Hi, we installed the hanging lamp by using a small hook and we drilled a small hole, being VERY careful not to drill up into the top of the camper! It is electric and we do take it down when we lower the camper. I used a small stick on hook on the ceiling recently for a small hanging plant and it is sticking nicely, but isn’t too heavy. I also mentioned to a reader before I did receive some cute battery lanterns from Target that could also be hung, not super heavy. I hope this helps you out and so far there has been no leaks due to the hanging lamp. I love the mini blinds! What size screws did you used? I’m looking to add mini blinds to mine but am worried about drilling through the top. Hi, I believe we used the smaller set of screws that came with the blinds. Hope this helps, and so far no leaks from anything I have hung! Gorgeous makeover!!! I too love the look of the mini blinds! It looks so airy. The color scheme is wonderful! I will definitely be using some of your ideas. We have a 2003 Sun Valley which the set up is a little different. 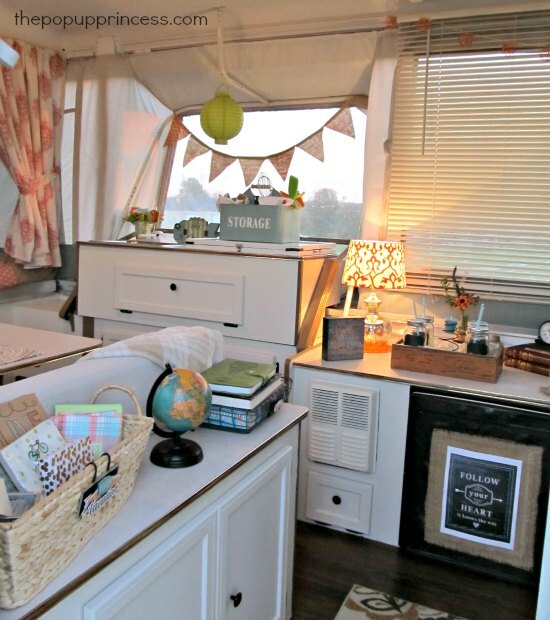 I will make a valance to go around the top of the windows and make curtains just for the bunks. 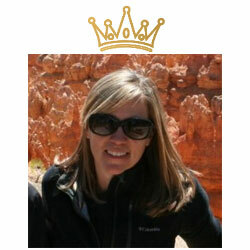 Thank you for sharing your Wonderful makeover!